Stuart Wylie, Age 33: He Worked too Hard, and Died too Young. TUART WYLIE is the Jimi Hendrix of Lancaster County printing. He worked too hard, and died too young, at age 33, but in the process he created one of the most remarkable Pennsylvania printing companies of his era. Stuart was a star. Everyone loved him, especially the "bindery girls" in his bookbinding department ...and his buddies at the firehall, who draped their hall in black for 30 days, after Stuart's unexpected death. Stuart was a Scots-Irish school teacher who left his classroom to learn the printer's trade. He started his career as a type setter for Lancaster's Independent Whig newspaper. Within a few months he moved into the editorial office and, soon began to acquire newspaper companies. In 1868 Stuart created the largest printing company ever seen in Lancaster, the Inquirer Printing House, on the first block of North Queen Street. His mammoth company employed an average of 160 employees, and printed nine weekly newspapers and 20 monthly periodicals, plus countless books and pamphlets, for clients across the U.S.
Stuart ran 12 steam presses all day, and many nights, often with double sets of workers. He was the first to bring stereotyping to Lancaster. But it all was cut short in 1873, when Stuart died from a brief, unknown illness after a trip to Philadelphia. His Inquirer printing company would never fully recover. Stuart's Inquirer newspaper company was competing with the local newspapers that eventually evolved into today's Lancaster Newspapers. Had he not died young, we might well be reading his family's newspapers today. Above: After Stuart Wylie died in 1873, his Inquirer Printing Company would never be the same. A few years later, the company was purchased by Stuart's former editor, Ellwood Griest, who owned and operated this company until his death in 1900. Ellwood printed a full range of typically-tedious, late 19th century books. Fortunately, he also decided to print what must be the zaniest publication of his printing career, the 1883 student year book of Lancaster's Franklin and Marshall College. This 1883 yearbook, titled Oriflamme, was the school's first student yearbook. Above: F&M College's 1883 Oriflamme Yearbook. Printed by Inquirer Printing. Also this year, the 21-year-old printer / biker D. B. Landis was working for this Inquirer Printing Company. 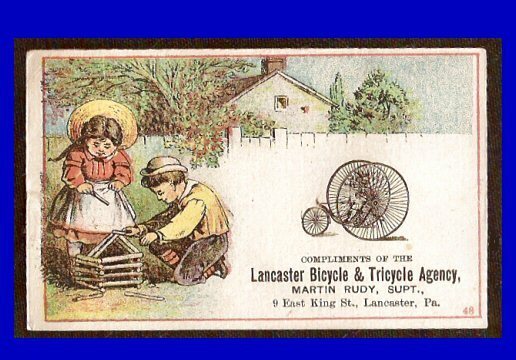 D. B. Landis was an enthusiastic member of the Lancaster Cycling Club and the League of American Wheelmen. He probably purchased his bicycle from Martin Rudy. Above: In the 1833 F&M College yearbook, the Oriflamme, the bicycle dealer Martin Rudy advertised that his bicycle-riding school was located at the same address as the Inquirer Printing Company, at 55 North Queen Street, Lancaster. (Why was his bike-riding school located at the Inquirer print shop? I don't know.) It was close to his bike shop, nearby on King Street, according to his trade card. Above: Simon Snyder Rathvon was Lancaster's brilliant, self-taught scientist / tailor / bug collector. Throughout his entire career, he was a mild-mannered tailor by day, and a brilliant scientist by night. He co-published and edited The Lancaster Farmer, printed by Wylie and Griest. Simon was born in Marietta, Lancaster County, and had only the basics of an elementary education. But Simon was intensely interested in the sciences, and became a leading American entomologist (insect study), and focused on protecting our crops from insect damage. Simon was a founding father of Lancaster's natural-history society, the Linnean Society, which studied the county's biology, botany, and outdoor sciences. 40,000 specimens collected by the Linnean Society helped create Lancaster's North Museum of Natural History and Science. 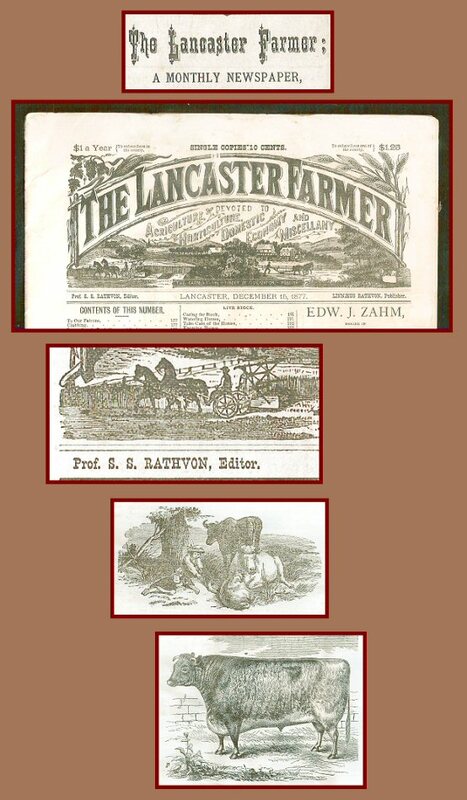 In 1869, Simon founded The Lancaster Farmer, which he edited and co-published. In this 1879 issue, Simon's son Linnaeus is listed as the publisher. At the peak of his career, Simon was the proud owner of 1,000 books and 10,000 insect specimens in his personal collection. Franklin and Marshall College gave him a well-deserved, honorary PhD in 1878. Simon Rathvon was Lancaster County's most colorful, home-grown editor-scientist-tailor. Simon's Lancaster Farmer was Lancaster County's third farming journal. It followed two short-lived periodicals, the Pennsylvania Farm Journal and the Lancaster County Farmer. Today, Lancaster County has another farm newspaper, Lancaster Farming, published in Ephrata. It is online, Here. It has been in continuous print for more than 50 years.